We got home from 4 days, 3 nights of camping this afternoon! We've all been hanging out together since last Saturday and no one has to go to work until Monday. It has all been pretty good up until recently when we've had a few snippets of making me want to go to work. Let's hope we make it to Monday without anyone running away (me). 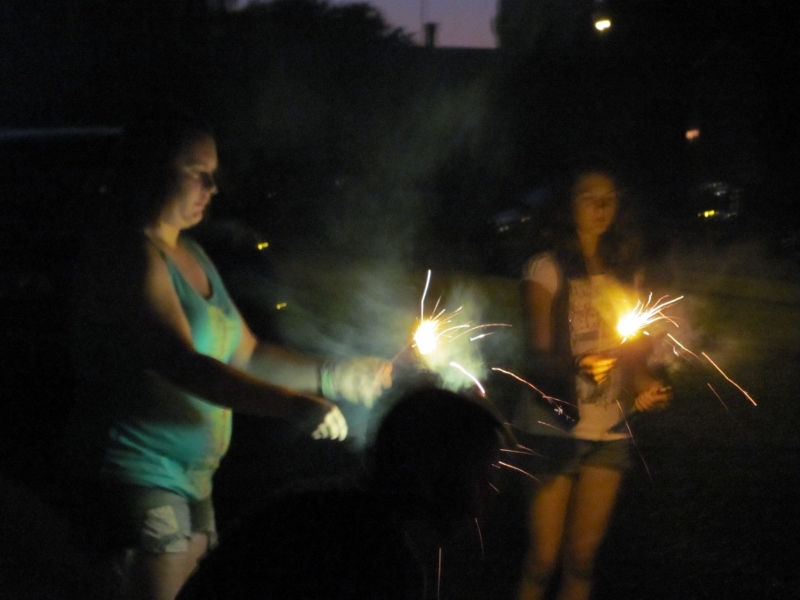 So on the 4th we went to my friend's house. I had been hoping we'd go to my brother's but they were all busy doing other things. We ended up going over to the friends a little later than when the party started, which was 2:00. We both figured 2:00 until the time fireworks would actually be happening was a really long time to hang out. Especially when it's 100 plus and they don't have a pool. Which means everyone is inside. Which means everyone ends up watching TV. Drinking. and/or playing Kinect. We got there around 6. They had already BBQ'd and my friend's boyfriend was sleeping since he had to go to work later. We ate a bit of the food and then talked-hung out-drank-played the Kinect. Eventually it was dark and they decided to break out the fireworks they had bought. 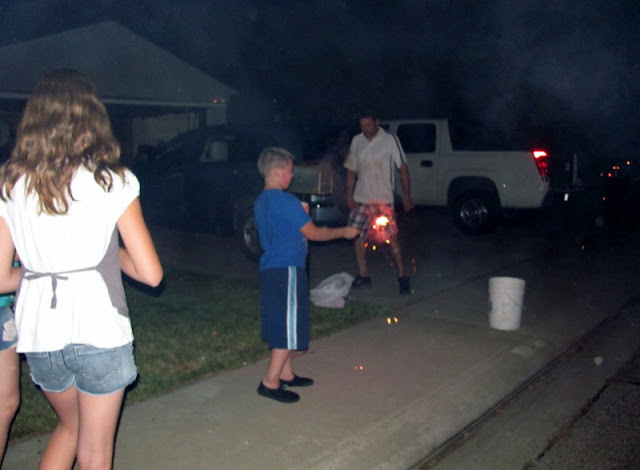 I PERSONALLY have never bought, touched, lit, thrown, waved around or put out a firework. They scare me. These people on the other hand, were all into it. 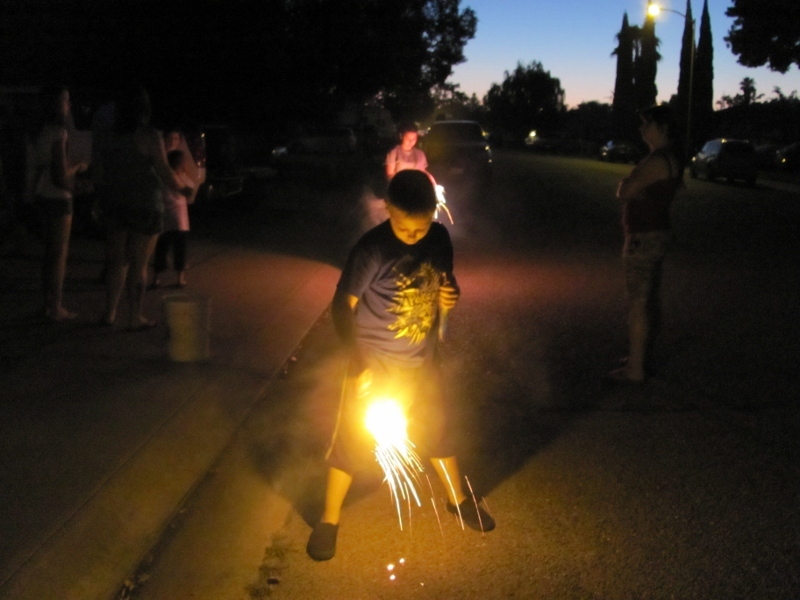 They didn't have anything too fancy but they gave the kids sparklers to play with. Trevor thought it was awesome. The girls did a couple but weren't that into it. Scott and I sounded like old ninnys telling him to be careful!! Watch out!! CAREFUL!! CAREFUL!! Eventually we could see the fireworks that my friend's city was putting off but no one cared but us. Kind of funny. Fireworks are darn dangerous! We don't buy any now cos of that, and they are so expensive too, and it's annoying when some don't even work. too dangerous for me - not something to play with.